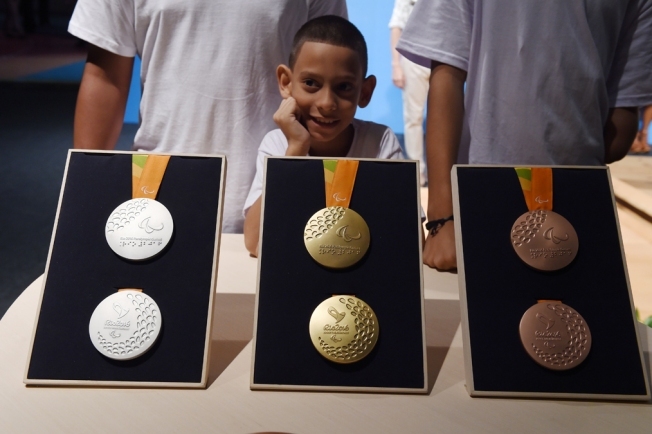 The gold, silver and bronze Olympic and Paralympic medals for the Rio Olympic Games 2016 presented at the Olympic Park in Rio de Janeiro, Brazil on June 14, 2016. Michigan-Ohio State. Auburn-Alabama. USC-UCLA. To sports fans from these schools, the mention of the rivalry gets the blood boiling. This summer, that hatred will extend all the way to Brazil. More than 450 athletes and alumni from NCAA schools will compete in the Summer Olympics in Rio, igniting age-old collegiate rivalries in sports like wrestling, track and field, swimming and more. Which means Michigan fans will want to know: Did we earn more medals than Ohio State? Rivals in Rio will answer that question. After every medal is awarded during the Summer Olympics, Rivals in Rio will update its medal count, awarding schools the appropriate medal. Since we know the questions will come, we want to explain exactly how we decide whether a college has earned a medal. It's pretty simple: If an athlete plays (or played) a sport for a school, earned a degree from a school, or is still in high school but signed a letter of intent to attend that school, then that school will get credit for any medals won in Rio. So Missy Franklin is competing for Cal, because she swam for the school for two years before turning professional. Katie Ledecky is competing for Stanford, because she signed a letter of intent to attend the school. Ryan Lochte graduated the University of Florida in 2007, so he's swimming for his Gators. But Michael Phelps, who trained in Ann Arbor for years and has a Michigan block M tattooed to his hip, isn't representing the Wolverines: While he attended classes at the school briefly, he never swam for Michigan or earned a degree. What about team sports? If a team wins a medal, every school with a player on the team gets credit for that medal - but no school can receive more than one medal per team. So if the U.S. women's basketball team wins a gold medal, UConn, Tennessee, LSU, Delaware, Baylor, Louisville and Minnesota will each earn a gold medal - but only one each, even though the team has five players from UConn. So check back here often during the Olympics game to see how your school is doing.